(Phys.org)—There isn't as much dark matter around today as there used to be. According to one of the most popular models of dark matter, the universe contained much more dark matter early on when the temperature was hotter. As the universe cooled, the dark matter annihilated away, at least up until a point when thermal equilibrium was reached and the annihilations ceased, resulting in the number of dark matter particles in the universe "freezing out" and remaining roughly constant. Although this scenario, called "the weakly-interacting-massive-particle" (WIMP) scenario, has been researched extensively, it's still unclear if the dark matter is indeed a WIMP. In a new study published in Physical Review Letters, Cornell physicists Jeff Asaf Dror, Eric Kuflik, and Wee Hao Ng have proposed a new mechanism for dark matter freeze-out in which there is not one but many dark sector particles that all co-decay to produce the observed dark matter density. One or more of these particles are potential candidates for dark matter. "For a long time, the Weakly Interacting Massive Particle (WIMP) has been the paradigm for explaining the particle nature of dark matter," Kuflik told Phys.org. "Most experiments to discover dark matter were designed to find something that looks like a WIMP. The motivation for our work was to try to find other explanations for the nature of dark matter that would be experimentally searched for in a qualitatively different way than the WIMP. "Co-decaying dark matter provides a new mechanism for dark matter to freeze out and obtain its observed relic abundance. Here dark matter can freeze out early in the universe and obtain the correct abundance we observe today. Its properties suggest that the current experiments would not be sensitive to this type of dark matter, but it can lead to other, unique experimental signatures. Furthermore, the mechanism is quite general and will be realized in many extensions of the standard model of particle physics." 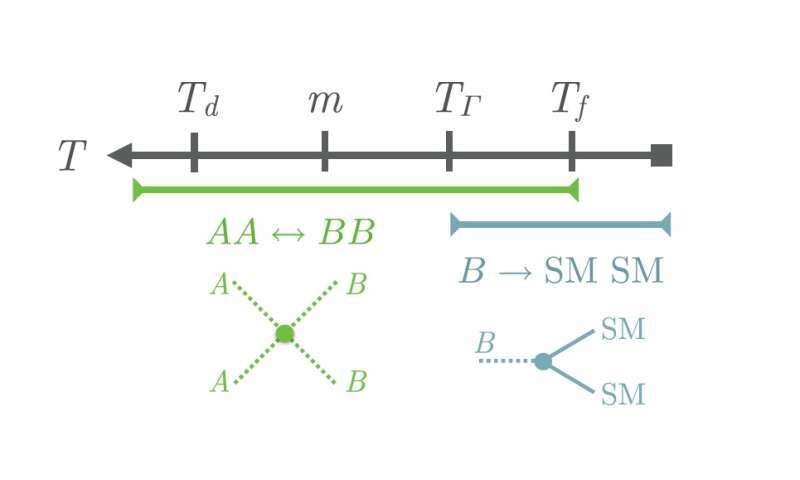 As the physicists explain, one of the biggest differences between the new mechanism and previous ones is that, in the new mechanism, the dark sector decouples from the standard model early on, which causes the two sectors to become out of equilibrium. This modification changes the decay rate by delaying the starting point of the decay, which causes the freeze-out to begin at later times. Ultimately this leads to a smaller dark matter density. If the dark matter density is smaller as predicted here, then in order to match the observed dark matter abundance, the annihilation rate must be larger than in previous mechanisms. The larger annihilation rate might be detected by future indirect-detection experiments, which could distinguish between the two scenarios. "Indirect-detection experiments for dark matter are experiments looking for the by-products of dark matter annihilating or decaying in space," Dror explained. "The experiments point telescopes or satellites in regions where a large number of dark matter particles are expected (for example, the center of galaxies). Often, the by-products are photons (the quanta of light) which can be detected near the Earth. In contrast, direct-detection experiments correspond to waiting for dark matter particles themselves to collide with particles in detectors on Earth. The primary advantage of indirect-detection over direct-detection methods is that while the latter assumes that dark matter will collide frequently with lab experiment, the former does not. Indeed, this need not be the case: co-decaying dark matter is a prime example in which direct-detection signals are small, while indirect-detection signals are prominent." The researchers plan to explore these possibilities in the future, and also further investigate the properties of dark matter particles and how this type of dark matter might fit into a larger framework. "We are looking into several novel effects that such dark matter can have," Ng said. "Some of these are still work-in-progress so we are not yet ready to discuss the results. One example of an effect we are exploring are particles that are produced at the LHC, transverse a large distance in the detector, and then decay into the dark matter. "We are also studying explicit particle realizations of co-decaying dark matter. Co-decaying dark matter is a framework to produce the correct abundance, and new particle physics models that realize the framework are being explored." The first time the claim that the early universe had dark matter seems to have been made. But that raises a significant problem for"officially" accepted physics, including "relativity". We are told now, at this time, that the amount of dark matter is exactly the amount needed to keep the universe from expanding forever. In fact, estimate of the amount of dark matter are arrived at subtracting accepted mass from the total that should keep the universe from expanding forever. But more dark matter would keep the universe from expanding at all! How did it expand, then at the "Big Bang"? And, note, even if the dark matter "annihilated", producing photons, photons also have a gravitational field, by mass-energy equivalence! So the universe should not even be expanding now! The authors take great pains to show that their theory fits the observational data at all epochs. How then do you arrive at the conclusion that there is any "significant problem for"officially" accepted physics, including "relativity""? Good grief! Just how ridiculous do things have to get before all the 'exotic' DM, BB, Inflation/Expansion etc 'hacks' get together to get their stories straight? Eg, too many 'theorists/writers' STILL seem blithely oblivious of recent mainstream astro discoveries of HUMONGOUS quantities/distributions of ORDINARY, EM-interacting/radiating, 'stuff' within/around/between galaxies/superclusters! These newer astro efforts prove past 'exotic DM' biased 'interpretations' of galaxy collision observations were WRONG. As I have long pointed out, all that ORDINARY, EM-interacting, gravitationally active, 'stuff' was ALREADY OUT THERE between the galaxies/superclusters. Hence NO 'exotic' DM 'needed' at all! When will these lame attempts to 'save' the ALREADY LONG FALSIFIED 'BB/DM etc' fantasy END? It's painful to watch such not-up-to-date, biased (plain ignorant?) 'hacks' add yet MORE epicycle-like crap to BB crap. With respect to RNP's assertion, if the amount of "dark matte' supposedly present now is enough to keep the universe from expanding forever, then the much, much more, indicated in the article, had to represent a much, much greater influence, at least gravitationally. If the particles annihilated each other, that would mean they formed photons. But, by "relativity", photons also have a gravitational pull! That means there should always have been a gravitational pull on the matter of the universe strong enough to keep it from expansion, likely even strong enough to keep it from expanding as it did, or at all. The absence of this massive gravitational pull that all these photons from annihilated "black matter" particles indicates that they didn't exist of matter and energy are not equivalent, which is that "relativity" says. .......Rguy, just knock it off withh the "observational" nonsense you like to prattle on with. Anything that is "observational" can be photographed & you have no photos of DM, only purple airbrushed smudges overlaid across old pictures of some distant galaxy no one has ever heard of. .....what "physics" are you even talking about? A bunch of airbrushed pics with all kinds of inserted filaments & lines with falsely inserted purple smudges? Yeah, great science.......great "physics". What has "relativity" got to do with Zwicky's DM fantasies. Einstein never made any reference to DM in either SR or GR, so why do you bring that up, or is it that you just don't know any better? PPS: When will these lame attempts to 'save' the ALREADY LONG FALSIFIED 'BB/DM etc' fantasy END? It's painful to watch such not-up-to-date, biased (plain ignorant?) 'hacks' add yet MORE epicycle-like crap to BB crap. Well, the theory for epicycles started around 300 BC. Copernicus proposed heliocentricity in 1514.... So, going by that you have another 16 or 17 hundred years before things move forward. ......exactly right, but Rguy thinks photons are massless & does not know from Special Relativity they are not, in fact the inherent mass of a photn can be calculated, Einstein did it. That means there should always have been a gravitational pull on the matter of the universe strong enough to keep it from expansion.... or at all. Especially so when considering that the author is suggesting there was more than the 80-95% present day content. The absence of this massive gravitational pull that all these photons from annihilated "black matter" particles indicates they didn't exist or matter and energy are not equivalent, which is that "relativity" says. DM particles are likely Planck volumes of mass - not quantified. At the BB (sorry RC) there was likely 1 Planck volume of extremely high mass/energy/temperature. This is decaying (exponentially) into many more particles of lower mass/energy/temperature which we see as spacetime expansion. Gradients in the density of these particles is what we see as gravity or DM. There is no such thing as antimass or annihilation of DM particles. Only cooling from (non-uniform) expansion and decay into photons. The only visible matter we see in the filaments between galaxies is from background sources. "Clumpy" DM smooths out with time but does not annihilate. ,,,, and leave the silly stuffs off the physorg. Who says the amount of dark matter present will stop the universe from expanding forever Julian? I think I heard something about the amount of dark matter present is enough to make the U flat. That means in whatever direction you look the path of light on the average is straight. They call it flat because some people say matter curves spacetime. Actually the only thing that is curved is the path of light travelling through spacetime. It is called experimental physics. The mathematical mumbo-jumbo is called theoretical physics. Rguy thinks photons are massless & does not know from Special Relativity they are not, in fact the inherent mass of a photon can be calculated, Einstein did it. You are such a clown. Ahahahaha. ...by "relativity", photons also have a gravitational pull! I don't think so. Light is bent or curved because the photons in their wave fronts are refracted. That is they travel at different speeds through mediums of different density or refractive index. In gravitational lensing spacetime is stretched (supposedly by DM) so it takes longer for photons to move through it. With eyeglasses the path of the photon is more cluttered with atoms and so slowed down. Same effect. Yes they have. All energy exerts gravitational pull. Not when it has uniform density. Why would it? Gravity is caused by gradients in the energy density. You could say all energy has different density and that causes gravitational pull but that would be a stretch pun intended. Just another ad hoc patch to salvage the ad hoc dark matter patch to save the plasma ignoramuses from the unemployment line. Whoa Nelly! Easy there! I would be the last man to try to save the DM patch. In cosmology the average energy mass density, not its distribution, codetermines whether the universe expands forever, halts or collapses, through gravity. According to repulsive gravity there will be no more gravity when the U stops expanding, if ever, if I understand it correctly. There will be nothing left to collapse the U except perhaps a phase transition which could happen as T approaches 0 or anytime I guess. What is "repulsive gravity" ? Sounds like gratuitous idea without fundament. In my view it is the expansion of spacetime due to dark energy which squeezes out matter because matter does not expand and push back like dark energy. Matter displaces dark energy leading to a lower concentration of DE in regions of matter. Since there is much more expanding spacetime outside the region of matter than inside the region there is a net inward force on regions of matter. Explains DM too but that gets rather involved. Actually I think it's equivalent to Erik Verlinde's entropic or emergent gravity but I'm not really into entropy or information theory. The Verlinde theory is discussed at http://phys.org/n...rk.html. Which requires more energy, a push or a pull? The Universe, being "miserly" in it's energy expenditure modality will pick the most efficient. More than likely, tho, it's an (imbalanced)combination. Let's compare the big bang to a piece of dynamite exploding in space. Particles would disperse like expanding spheres. Particles with more energy would have more velocity and outpace the slower moving particles and particles with identical speed would separate due to slightly different angles from the initial explosion. Going back to the big bang now wouldn't our observation of an expanding universe be shown from this same effect? The universe appears to be expanding because particles just naturally do so from an explosion. My hypothesis is that when a black hole reaches a critical mass it eventually becomes unstable and creates a big bang type explosion. Expanding on my hypothesis if you were to magically go inside the event horizon of a BH and observe it you would see something very similar to a neutron star, just denser. Black holes with more matter would be even denser, but you would need infinite matter to become a point. This would be similar to trying to accelerate an object to light speed. The closer you get the more energy/matter you require for the same gain. When the black hole reaches a critical density (requiring approximately the amount of matter in the big bang. this may be something around the width of the black hole being the plank length) it has some kind of phase change where all the matter converts to energy. Then it begins expanding (explodes) and begins converting back into matter in the form of basic particles. This is the big bang and likely not the first time either. Verlinde's work is specifically discussed in his publicly available article. You have read it , I presume? The abstract is all I have found so far. Anyway, could you elaborate on the connection with you rather casual remarks about "repulsive gravity"? The link I referred to discusses DE from the perspective of the holographic principle and the internal energy of spacetime. As I see it the holographic principle would give us the energy from visible particles, about 5% of our energy budget. The internal energy of spacetime would correspond to DM - about 20%. The repulsive force of expansion is what would cause regions of DM to clump together as I think they mentioned. Just how this occurs gets into the minute details of how repulsive gravity works with supposedly dark matter. Basically it's the same thing as repulsive gravity for visible matter. We can get into it but it gets quite involved. Mostly configuration arguments and not formulas - like with a blackboard. Basically we would have to model spacetime as an expanding elastic penetrable medium. Not fun stuff. Interesting article at http://www.space....1207-sdc "This latest result indicates that dark matter in the cosmic web, which accounts for about one-quarter of the content of the universe, is less clumpy than we previously believed,"
indicating as the clumpy stuffs clump together (by gravity, I presume) so smoothing out the clumps. Black holes with more matter would be even denser, but you would need infinite matter to become a point. True but I think the singularity in a black hole is in spacetime, not matter. Conversely at the BB the singularity would be in matter. Your <13> 'Repulsive' Gravitation (Multi-Body) section could be much simplified if you're talking about expanding spacetime and non-expanding (quantized) matter. Given any region of matter the expanding spacetime density will be less than that outside of the region with no matter to displace the expanding spacetime. Hence matter inside the region will be squeezed. Galaxies will be effective low pressure areas of expanding spacetime. In addition, low pressure regions will attract each other so the region between them will be stretched, assuming spacetime is flexible. This stretched region will cause light to take longer to go from point A to point B leading to gravitational lensing. Thus filaments of so-called dark matter between galaxies. - probably qualifies as what you would call word salad.